Part one (Bath Products) of our coverage from Milan's Salone del Mobile, the International Bath Exhibition, and Eurocucina, perhaps the most important kitchen and bath shows in the world. The International Bath Exhibition that is part of the massive Salone del Mobile and Design Week in Milan really reflects the evolution of the bath—as spa and sanctuary for relaxation and wellness. Held every other year with Eurocucina, this seventh installment featured 243 exhibitors in 20,600 square meters of space. Modern looks dominated the show, with sleek forms in bath wares and taps and wall hung-vanities a standard. But there was a new movement afoot—actually legs—which lend a more furniture feel and a rich range of style possibilities. There was most definitely a mid-mod vibe, and even an industrial one, splendidly illustrated by Diesel Living and its first bath collaboration with Scavolini. Matte surfaces in this sector echoed their growing popularity in kitchens, although glossy porcelains sometimes proved an inviting contrast. Neutrals—cream, warm cappuccino and beautiful chocolate marbles—felt most comfortable, but black rose to the occasion, with black chrome adding an edge in faucets. Form shone in the hands of masters such as Piero Lissoni, whose new freestanding tub for Boffi, is smooth as silk and most elegant in shape. 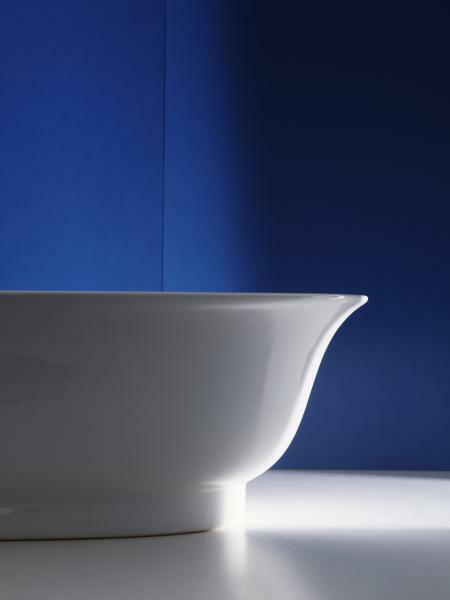 Marcel Wanders dazzled with the simplicity of New Classic sink bowls designed in Laufen’s proprietary SaphirKeramic. 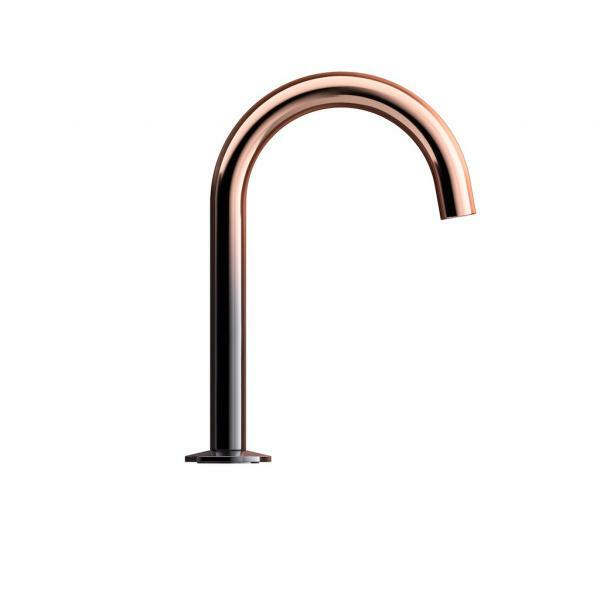 And Michael Anasstasiades, known for his lighting design for Flos, kept it simple with his new taps for Fantini, engaging with a spout that was held shy of the mounted surface. Taps celebrated minimal form, some with sculptural notes. Others combined stone or cut crystal for luxe punctuation. And unexpected materials such as Axor’s taps in topstitched leather or wood create a bespoke option that fosters personalization. Color usually showed up as a backdrop on painted or wallpapered walls, although some vanities served up small doses such as blue green, cobalt or aubergine (in Duravit’s X-square range). 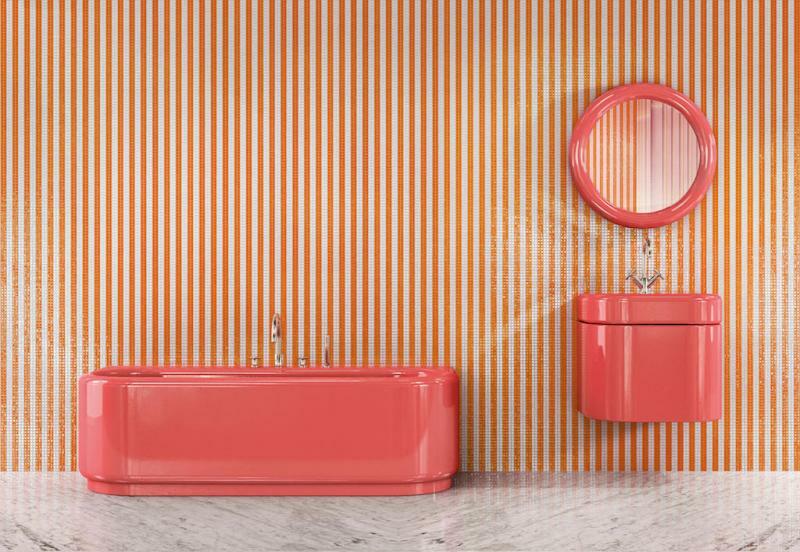 India Mahdavi’s new collection for Bisazza showed unabashed color—with fixtures in a shrimp shade called strawberry, blueberry and pistachio, with companion mosaic tiles on walls. And Kohler showed off its moody dark floral bowls that nod to Dutch masters in its Artists Edition series. Cutting edge aesthetics were met by a focus on sustainability—water efficiency and air quality as well as personal hygiene and wellness. 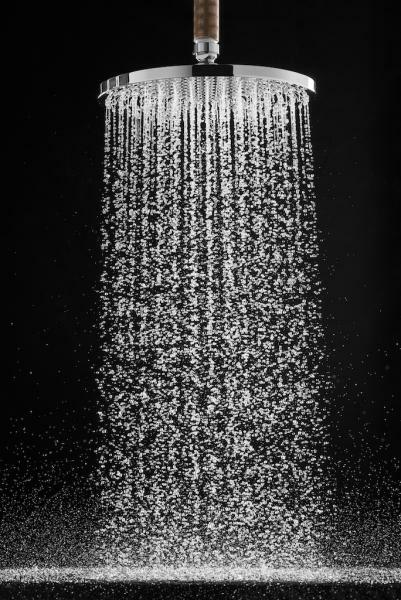 Feeling the soft droplets of water from Hansgrohe’s PowderRain took rain showers to another level. There is something to be said about a well-designed bath: It does make you feel good. Here are 15 introductions that caught our attention at the show. The hip brand clothing and lifestyle brand Diesel flexed its bath design muscle in a first time collaboration with Scavolini called Diesel Open Workshop. 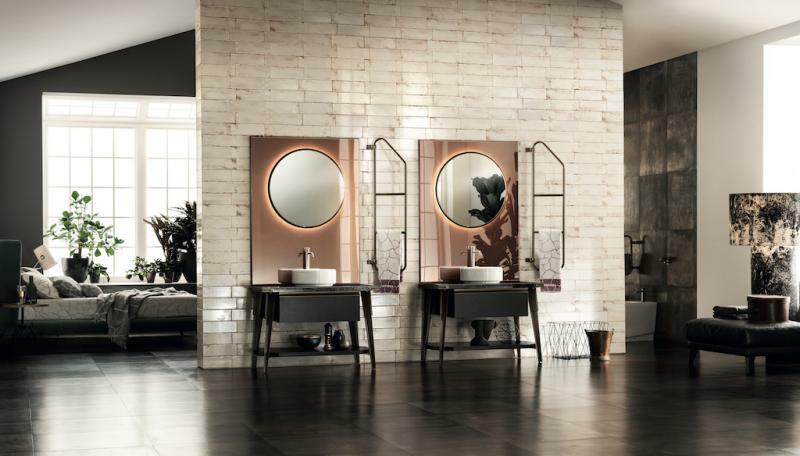 The industrial, minimal design features copper effect Stopsol mirror panels that serve as a backdrop to the bath cabinet. The washbasin unit features another powerful styling element, a tubular towel rail that swivels. 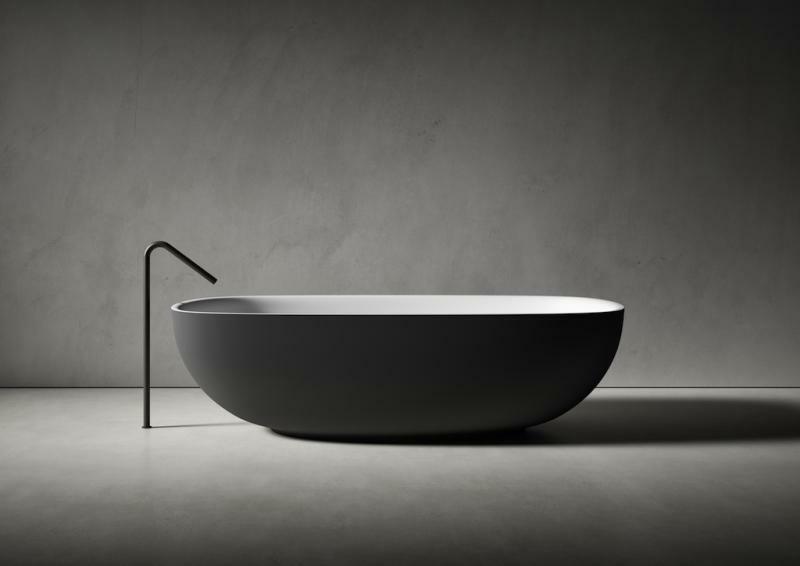 Simple and sensuous lines and a dark/light contrast are masterfully handled by Piero Lissoni in the Faroe bathtub for Boffi. The very generous basin is a rounded rectangle crafted from a velvety-to-the touch, Cristalplant. 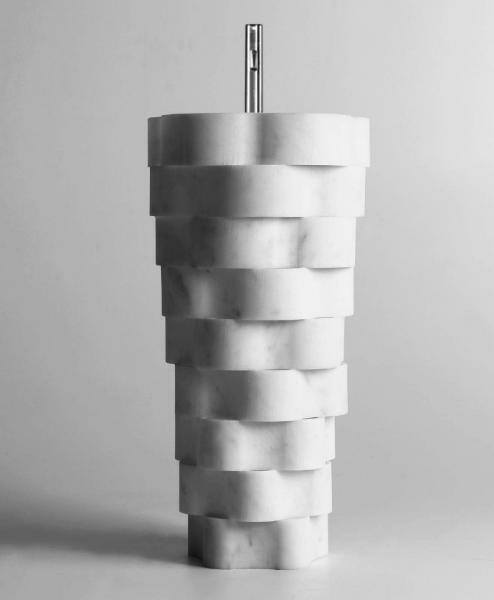 The arresting form of Intreccio by Paolo Ulian for Antoniolupi tells a story about craftsmanship as well as sustainability, as it’s composed of stacked cutouts from single blocks of marble that were used to create a line of washbasins. India Mahdavi’s collaboration with Bisazza is as ebullient as the hues: strawberry, blueberry, and pistachio. The collection includes a lacquered fiberglass bathtub; glazed ceramic washbasin, and a gloss lacquered wood wall-mounted cabinet and mirror. The two-handle basin mixer comes in gloss dark chrome. Marcel Wanders reimagined Laufen’s proprietary material, SaphirKeramic, to fashion a graceful, sinuous bowl that he says connects “with the human spirit” in the intimate bath space. Ceramic pieces in intense white are joined with cabinets in wood, legs, faucets and mirrors with ceramic frames, lending an evocative and delicate bath environment. Known for his lighting for Flos, Michael Anastassiades now has branched into bath design with a first collection, a collaboration between Boffi and Fantini. The About Water bath faucet features a handle and spout, combined with a third, horizontal cylindrical element. 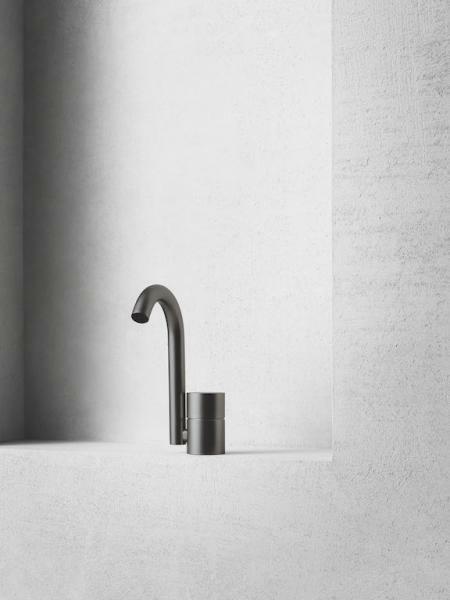 The suspended spout stands above the surface, showing a technical achievement that’s also beautiful in its aesthetic. An angular chrome profile sets the modern XSquare bathroom apart. 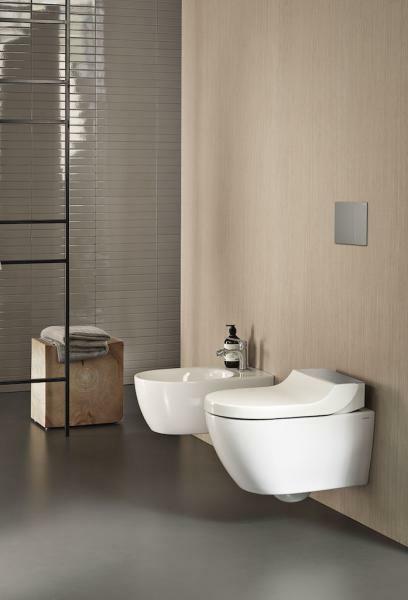 Designed by Kurt Merki Jr. for Duravit, the vanity’s transition from frame to leg is seamless and streamlined. Three new furniture finishes (matte light blue, matte concrete gray, and satin-matte aubergine as well as the linen décor finish) round off the vibrant color range. Available in seven different widths, the mirror features touch-free control of the light and mirror heating. Customization is a buzzword in all areas of home design, and one solution from Axor is to create a wardrobe of tap tops called MyEdition, with choices that include topstitched leather and wood as well as stone. The new faucet line can be equipped with different cover plates also including metal, marble, porcelain, fabric, or glass. Demos of Raindance with Hansgrohe’s newest PowerRain spray proved to be soft and silky, due to the production of multiple small beads of water, says Jan Heisterhagen, vice president of product management. Each nozzle needs to be distributed cross the spray disc with precision. Bonus: the shower sound is reduced by around 20 percent. Designer Stéphanie Coutas sourced her signature “grand antique d’Aubert” marble from the south of France to craft a pair of stylish squared pillar handles for THG’s new Montaigne collection of taps. 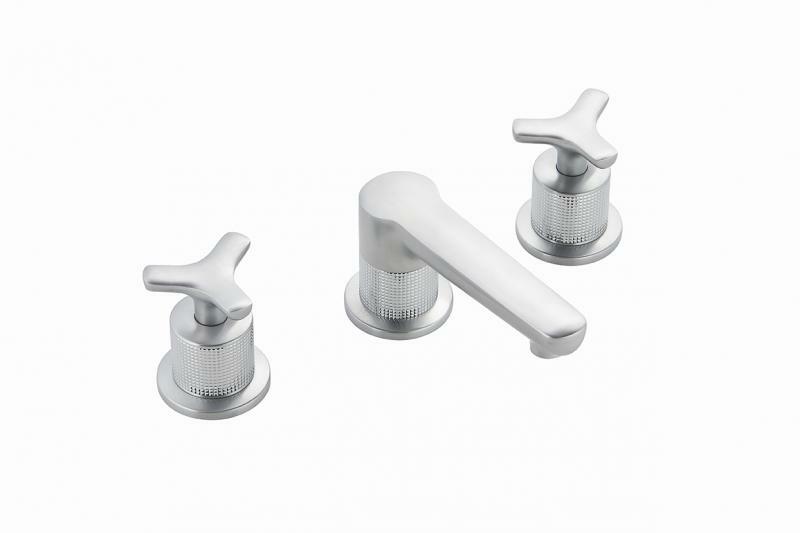 The collection is available in polished chrome, polished nickel, soft gold, rose gold, and black nickel. 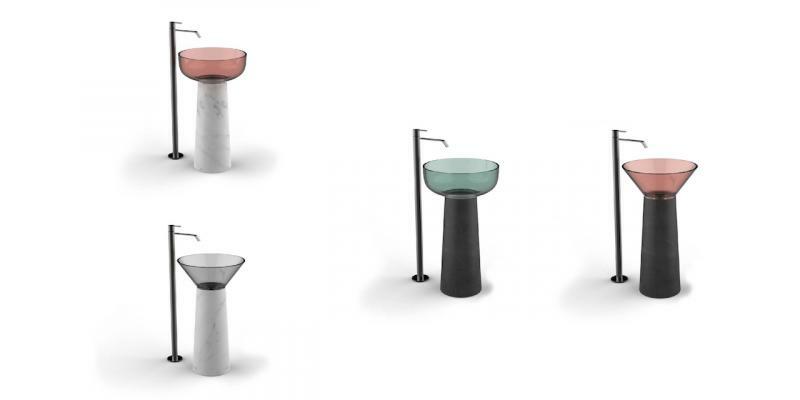 Subtle colored glass basins contrast with marble bases in the Albume design by Carlo Columbo for Antoniolupi. The base is available in bianco Carrara or Nero Marquinia marble. 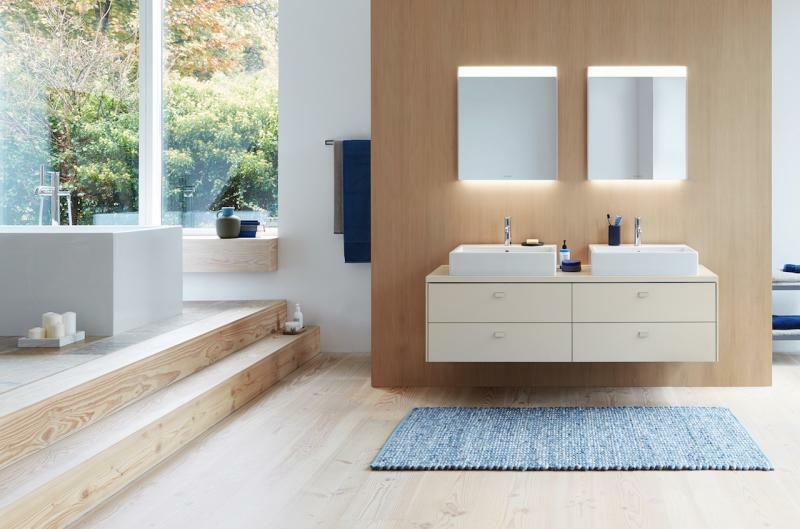 Brioso updates a classic cabinet form with slender legs and subtle, playful, geometric handles that mimic an edge pull in a design for Duravit by Christian Werner. The vanity is available in 15 finishes, real wood veneers or lacquers in matte or gloss, contemporary hues like light blue (matte) and concrete gray as well as classic linen. Legs also are available in chrome or lacquer. The mirrors boast 300 lux-strong LED edging light, with touch-free controls. 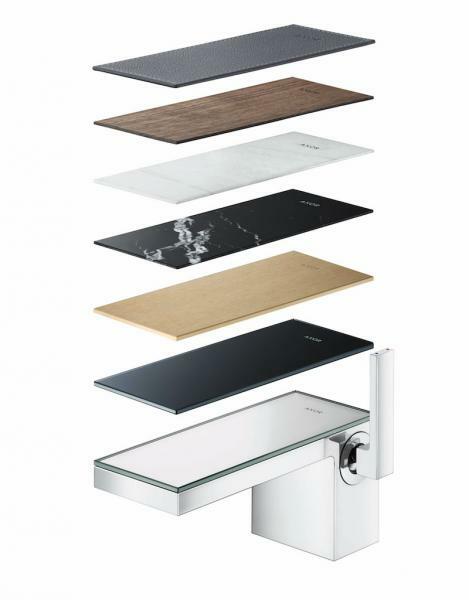 An extension of Gerberit’s Aqua Clean range, the new Tuma Classic features whirlSpray shower technology with five adjustable pressure settings, “gently cleaning lady wash,” odor extraction, warm air dryer, WC seat heating, remote control, and optional elegant wall mounted control panel. 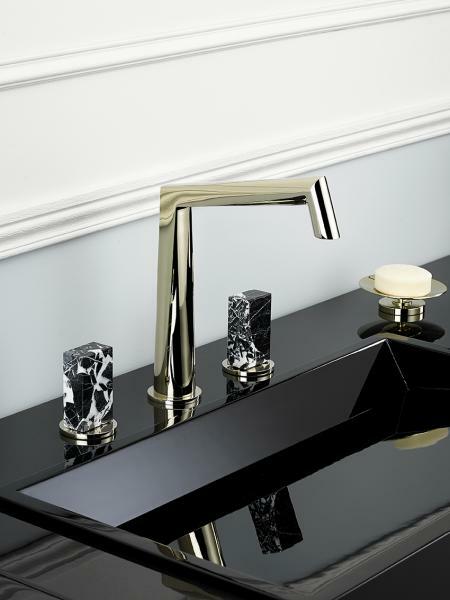 Designed by sculptor Arik Levy, the new System range from THG includes precious materials like marble and cut crystal. The handles “defy geometries,” adapting a malleable form that’s comfortable to touch and intended to mimic the flow of water, the company says. Basin and shower mixers feature several types of artistic engravings and inlays on handles and spouts. A gradated ombre finish is a new look for Kohler, optimal on clean minimal surfaces. The PVD ombre finish, which includes color pairings from rose gold to polished nickel an titanium to rose gold, was shown off at Fuorisalone, at the Museo Bagatti Valsecchi.